I have re-written this story arc five or six times in the last three years, just trying to get this right. Maybe they play by the rules of the witches from The Golden Compass. You only get the parent's features if you're the same gender as the parent. 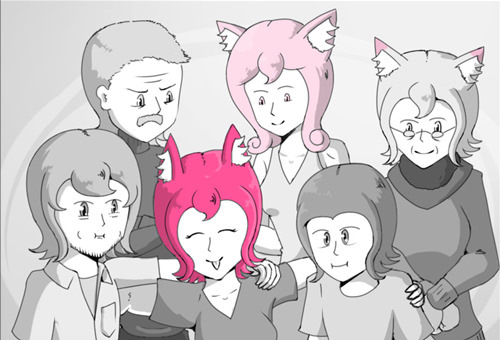 So if you're a boy who wants adorable cat ears, you need a neko for a father. @Hero of Comedy: That sounds like it would mean the Felis Sapien is going extinct. Pretty sure Dazzy isn't trying to make the fate of his persona go Dark.